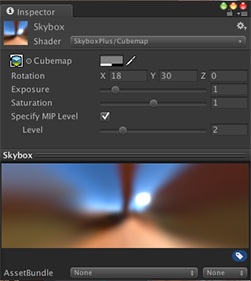 SkyboxPlus is a collection of skybox shaders for Unity. Unity 5.5 or later versions. Cubemap is a basic cubemapped skybox shader. The main difference from the standard skybox shader is that it can be rotated not only around the Y-axis but also around the X/Z-axis. It also has a saturation slider that can be used for adjusting the colorfulness of the cubemap. The MIP Level property controls the blurriness of the cubemap. It can be used for mimicking bokeh-like blur effects on the background. To make this option effective, it’s required to turn on the Glossy Reflection (pre-convolution for glossy reflection) switch in the texture importer settings. Also it’s recommended to use the Skybox component to apply different MIP levels to the camera background and lighting (reflection). 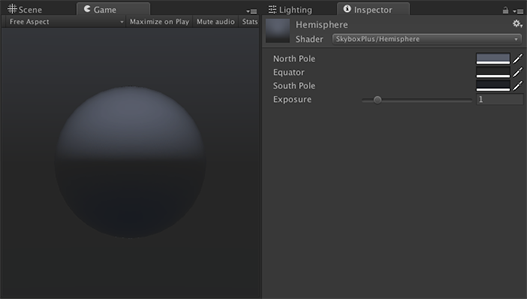 Hemisphere is a basic gradient skybox shader. It only has three color properties: color at the north pole, on the equator and at the south pole. The shader linearly interpolates between them. 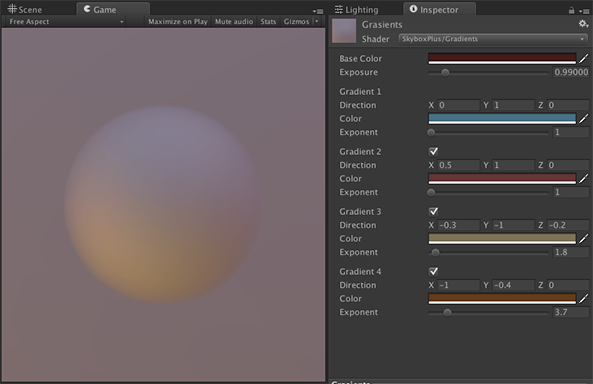 Gradients is an additive gradient skybox shader. Each gradient has a direction vector and a color value. The shader interpolates along the vector, from black to the given color. The shape of the gradient can be adjusted with the exponent property. Up to four gradients can be given at the same time.